Geelong Port hopes to attract more smaller coastal vessels moving state-to-state under future changes to national freight links and international shipping. However port chief Brett Winter said widening Geelong’s channel to allow two-way movement of ships was key to the port’s growth. “These plans might take 10 to 20 years to come to fruition but we can play our part,“ he said. 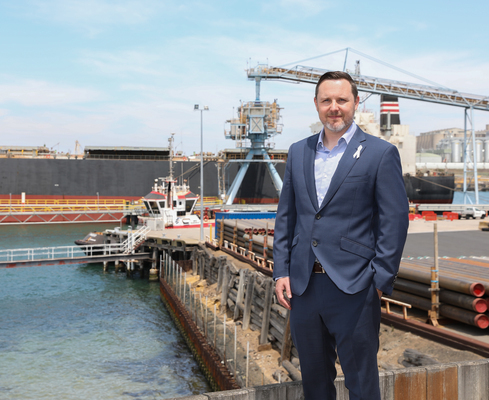 As Victoria’s pemier bulk port and regional gateway to Victoria, Geelong handled 635 vessel visits in 2018 and moved 12 million tonnes of product, Mr Winter said. Mr Winter said the port’s relationship with the renewables industry through Goldwind Australia, which supplies wind and solar farms in the region, was also strong. Mr Winter said additional smaller coastal vessels could potentially enter Geelong carrying bulk products such as grain, fertilisers as well as farming machinery, vehicles and other freight. “We can service a diverse set of trades. It’s about giving the importers options. Ports Australia chief Mike Gallacher recently called for greater use of Australia’s “blue highway” to relieve road congestion. “We need rail, road and shipping all working together to achieve a positive national outcome,“ he said.